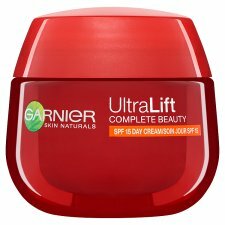 Is Garnier UltraLift Day Cream SPF 15 right for me? Yes if you are looking for a daily moisturiser that makes your skin look younger targeting wrinkles, loss of firmness and uneven complexion. 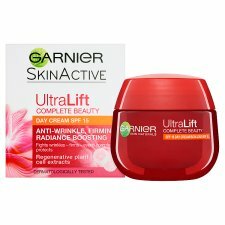 UltraLift Complete Beauty Day Cream SPF 15 is Garnier's new generation of anti-wrinkle care. For the first time, a Garnier moisturiser, is enriched with regenerative plant cells, and associates UVA/UVB SPF15 protection for a complete anti-ageing action: anti-wrinkle, anti-spots, firming and radiance boosting. 1. Anti-wrinkle: Visibly reduces the appearance of wrinkles, even deep ones by plumping the skin with moisture. 2. Firming: Leaves your skin feeling firmer and looking tightened. 3. Radiance Boosting: Evens your skin complexion and reveals your natural radiance. Regenerative plant cells are powerful plant cells due to their ability to continuously regenerate themselves to sustain plant life cycle. Garnier to understand and identify how to target skin firmness, wrinkles and radiance. 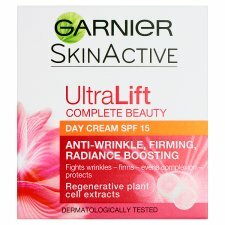 Now Garnier introduces Regenerative Plant Cells in a complete skincare range, creating UltraLift Complete Beauty. We use, wherever possible, naturally derived active ingredients which have been carefully extracted to preserve their quality and purity. Our products have proven efficacy and results that you can see for yourself. Does not contain any chlorine. Step 1: Match your crow's feet to the closest image. Note the grade down. Step 2: Apply UltraLift Complete Beauty Day Cream SPF 15 everyday for 28 days. Step 3: Repeat step 1 and discover the results!